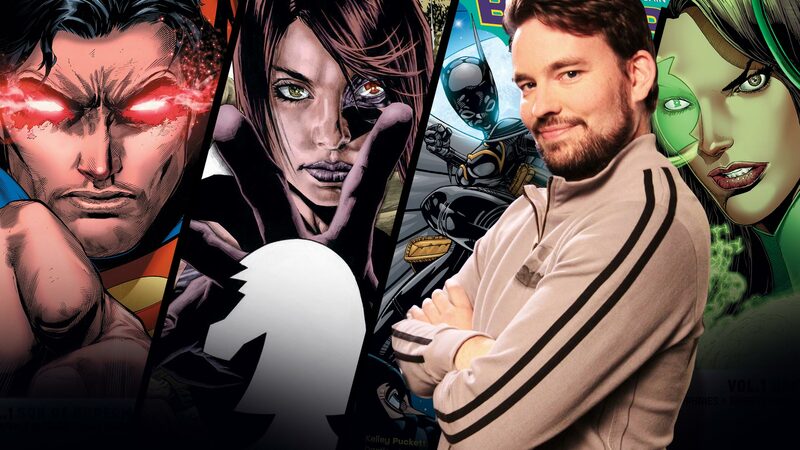 “Jason’s Picks” is a new monthly column by DC All Access co-host Jason Inman. A longtime DC reader, Jason will select a few newly released or essential graphic novels each month that are personal favorites of his and discuss why you need them in your collection. From hot new comics to deeper cuts that may not get as much attention, these picks guarantee a great month of reading. We all love the joy of picking up our comics weekly at our local comic book shop. But often comic fans forget about another valid and just as enjoyable way to ingest our comics—the collected edition or graphic novel! These little bundles of joy allow a reader to experience a character or storyline all in one go. Plus, they are one of my favorite ways to read comics. As the co-host of DC All Access, I get to pick the brains of our favorite DC creators; revealing their favorite heroes and stories of old. Now, you will have the chance to see inside my mind computer! Buckle up as I suggest some of the best DC content available in graphic novel form this month. Of course, there’s a lot material that’s great in trade for readers, but this is simply my picks for the cream of the crop. There’s a new Superman in the DC Universe and he’s very familiar to old readers. If you have ever been curious to read the tales of the last son of Krypton, this is the perfect jumping on point. Superman, with his wife Lois, must train his son Jonathan to use his new abilities. Over the years, in many imaginary stories, Superman has had many children. (Anyone remember Joel Kent?) This story strips away all the silliness around the concept and digs deep into the emotions of how the most powerful man in the world would raise his child. Peter J. Tomasi and Patrick Gleason inject real emotion into the stories. So much so, that one could theorize maybe they have super children of their own. If you want to read a book that will make you leap tall buildings in a single bound, then Superman Vol. 1 is for you. This is not your Barbara Gordon Batgirl series. Say hello to Cassandra Cain, who was Batgirl for most of the 2000s (and has recently returned as Orphan in DETECTIVE COMICS). When I was in high school, there was no Batgirl in the DCU until the Batman event, NO MAN’S LAND, introduced us to a Batgirl that had a full face mask! I still remember the first time I saw an image of her costume; I was blown away! Batgirl Vol. 3 collects Cassandra Cain’s solo series with fantastic art by Damian Scott and is written by the Bat-maestro himself, Chuck Dixon. Even though it’s the third volume, most of these issues are pretty new reader friendly. Plus this volume includes a Joker story and a Spoiler cameo! Trust me, this series is a gem in the crown of DC’s Bat family. If you’ve been checking your comic shop lately, DC has been releasing some complete collections of older comics including ROBIN, THE FLASH BY MARK WAID, and my favorite, NIGHTWING. Well, this book continues that tradition. Checkmate is the secret society in the DC Universe that deals with dangerous threats while also serving the UN. It’s super heroes mixed with politics—a story theme that Greg Rucka is a master at. This Checkmate series was released after the events of INFINITE CRISIS and tries to pick up the pieces of that major event. As a reader when this was published, it was crazy to me to think that Green Lantern Alan Scott would be onboard with this organization. But he is and he’s teaming up with Mister Terrific, Fire, Amanda Waller and Batman character Sasha Bordeaux (look her up, she’s cool). A tale of intrigue told with the backdrop of super heroes, Greg Rucka’s Checkmate is a great series. One of the coolest things about DC Rebirth was its ability to recast familiar concepts in new ways. This collection brings that premise to the front in its title! Who would have thought just a simple “s” could change so much? Sam Humphries turned the book that used to tell the tales of the veteran lantern into a story about rookies. Simon Baz and Jessica Cruz quickly worked their way into my heart by showing us all that being a Green Lantern isn’t easy. Would any of us do better with a Green Lantern ring? Who knows? And that’s what makes this collection so enjoyable. Those are my picks for the four graphic novels you should pick up in January. DC has plenty more for you to read and enjoy. So next time you hit up your local comic book shop, peruse a little and see what you discover. A story from the past could create a big emotion now. See you next month for February’s picks!